Bitcoin has astonished everyone with its unimaginable jump in value, over the recent time. There are mixed opinions about the currency as some also call it a scam (no idea why and how) and some refer to it as a digital revolution. Although Bitcoin is nothing more than an investment which is subject to market risks, as the value changes every moment due to the demand and supply from all over the world. However, Bitcoin trading is not possible without a Bitcoin wallet. As of now, you’re not allowed to keep Bitcoin in your bank accounts. Cold and Hot wallets: If you have been trading in Bitcoins, you must have come across the term cold and hot wallets. Though both the wallets are used to keep your Bitcoins safe, there’s only one difference between them. The cold wallet is an offline wallet wherein the hot wallet is an online one. It means, hot wallet may be able to show you the actual worth of your saved BTC but the cold wallet would show you only the total BTC you have. Desktop Wallets: Desktop wallets are more of a software, which you can download and install on your laptop or desktop. The advantage of these wallets is that they are very handy and easily accessible. However, it is important that you do adequate research in choosing one for you as the level of security in different wallets may vary. Desktop wallets are available in Windows, Mac and Ubuntu. You may choose anyone of them based on the machine type you have. Mobile Wallets: Mobile Bitcoin wallets are the most successful and favored wallets in the world. They give you the access of your asset at the very moment you want. Mobile wallets have been proven to be the safest wallets due to the QR code generation. It helps you get your BTC transferred by simply scanning the code, which eliminates any possible typo. The mobile wallets are designed considering all the major mobile operating systems i.e. Android, iPhone and Windows. Online Web Wallets: Online web wallets work on the cloud servers, which give you the access of your Bitcoins from anywhere you want. Though they appear to work like a desktop wallet, they let you transact from any machine and from anywhere in the world. You just have to login to your account and enjoy the services. Paper Wallets: Well, Bitcoin is no more only a digital currency as it can be stored safely in the form of paper. You just have to generate a paper wallet from any popular blockchain service provider, print it and put them in the locker. They’re also one of the safest ways to keep your BTC unaltered. 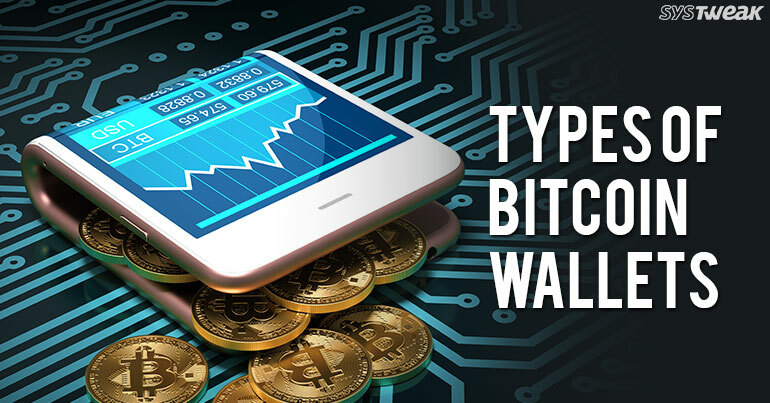 Now that you know the popular types of Bitcoin wallets that you can use, select the one that seems to satisfy your requirements. You must be aware that Bitcoin investments are subject to market risks and you must use your discretion before investing.